Instant and direct relief for hot flashes. Nothing better than cool refreshing air. Try this all-new-product, a small mini fan with real cooling power. Stop hot flashes now! Many women going through menopause may suffer uncomfortable intervals of hot flashes (also known as heat flushes), where the chest and face becomes hot. Typical solutions are the use of personal fans, medication and herbal supplements; all with one aim - to cool the face down. The thing is... none of these do the job as effectively as Handy Cooler™. It a breakthrough invention that allows evaporative cooling to be used in a personal and portable scale to cool the face down. Use Handy Cooler™ Anytime Anywhere!! Thats cool moist air wherever you want. If you hate hot flashes, heat flushes, or any menopausal symptoms, this is the most convenient solution to the agonizing problems. Handy Cooler™ brings cool air to you face and chest - the natural solution to your body getting hot. Tired of trying medication, herbal supplements, cooling bands, cooling fans and cooling cream that don’t work? Handy Cooler™ will be the last thing you will need to try! Other solutions simply don’t work. Gimmick hot flash remedies like creams and topical products don’t really cool you down. If you’ve tried it, you know it. They only provide a ‘sensation’ of coolness on your skin. Reviews from herbal supplements and medication are not always positive. Why not solve the problem with a safe and reliable solution? Beat it naturally. What you really need is something that can literally cool you down. Ice packs are too harsh on your skin. Misting fans get you uncomfortably wet. Use Handy Cooler™ that can be conveniently carried anywhere with you! It will surely provide cool refreshing air to right where you need it when your hot flashes hit. 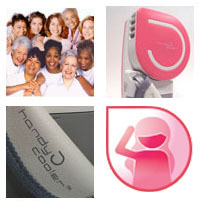 Designed and developed by people like you who suffer hot flashes. The invention of Handy Cooler™ was inspired by a son who wanted to alleviate his mother’s hot flashes. This lead to the creation of this wonderful hot flash cooler especially made for people like you. Use it anywhere. Relief for night sweats! On your bedside at night before you sleep. When a hot flash attacks you in the middle of the night, reach out for your Handy Cooler™ for instant hot flash relief. There is no better natural hot flash treatment. Place it in your kitchen to keep you cool while you cook in front of the burning hot stove. Take advantage of advanced technology. Its time to move on. Treat yourself better. You deserve it. Combat hot flashes with Handy Cooler™. Still using a conventional fan? A conventional fan only blows surrounding hot air onto your face. Handy Cooler™ on the other hand cools and moistens the air before delivering it. Depending on how hot and humid it is, our Handy Cooler™ can cool the air up to 30F (16C). Don’t believe it? Check out our photos for proof! Remember - Handy Cooler™ removes the heat from the air before it reaches you!